Spring means PROM Season! 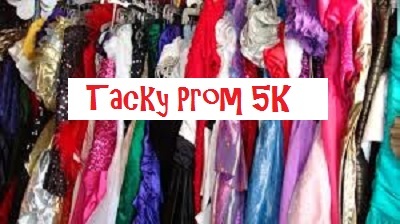 And that means it is time for our 4th Annual ‘Tacky Prom’ Free 5K in our FREE Fun Run Series! That’s right, we will be running in dresses, sequins, suits, hats…but we don’t recommend high heels! So….go dig through your parents (or your grandparents) closets, and find the tackiest of dresses or suits to wear as you join us for this FUN RUN on Sunday, May 12th! Check the thrift stores, check the local consignment shops….but remember you should be able to RUN in whatever you decide to wear! We can promise some photographic evidence for years to come after this event! You probably know the drill by now, but our Fun Run races are prediction races! Meaning that you don’t have to be the first person to cross the finish line in order to win the race, you just need to guess your finish time by the closest margin in order to be declared an official winner! Anyone that guesses their time within 10 seconds will be a race WINNER! On-site registration and bib pick-up will begin here at the shop at 8:00am. The race will begin promptly at 9:00am. Participants are encouraged to arrive no later than 8:30am. We also ask that everyone plan to park at St. Michaels Elementary School, located on Seymour Avenue, just a couple of blocks from the shop. We will have a brief race meeting in the front parking lot at 8:45am to review the course details and any special offers for participants immediately following the race. Come join us for a great event, and remember that our course is kid-, pet-, and stroller-friendly! All ages and abilities are welcome! !